Contact Us Today for Your Special Offer! LIMITED time offer valid for first 99 NEW patients. Cannot be combined with insurance or discount plans. Dr. Farshad Ghobbeh (known as “Dr. G” by his patients) is entering his 12th year of practice in dentistry, handling both general and complex procedures. 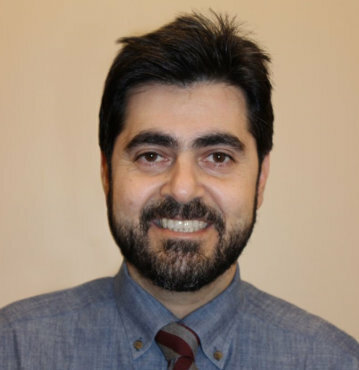 Dr. Ghobbeh has resided in Medford for 10 years with his lovely wife and son, and has become committed to providing the best quality care in the Medford region, and continuously educating the public about the importance of preventative oral care and hygiene. Dr. G spends a great deal of time getting to know his patients on a personal level, being a big believer in building long-term, trusting relationships with each and every person he sees in the office. Dr. G attended Tufts University School of Dental Medicine, graduating in 2005. In 2008, after three years of associate practice, he opened his first private dental practice in Medford, and continued to open three more practices after amazing patient feedback. In 2016, he built a brand new practice in Medford; GIO Dental at Station Landing — a modern, state of the art practice which he views as his greatest project to date. Always committed to learning more about dentistry and progressive dental techniques, Dr. G regularly enrolls in continuing education courses. He completed a mini residency in dental implant surgery, and he has certification in all dental implant restorations and overdentures, Invisalign™ and Botox™ administration. He is affiliated with the American Dental Association and the Massachusetts Dental Society. Are You Looking For High Quality General Dentistry in Medford? Call Us, We Can Help You! Regular dental visits are essential to make sure oral health problems — from tooth decay to oral cancer — are detected and treated in a timely manner. Here, to the dentists of Medford your oral health is our paramount concern. We want to make sure your teeth stay healthy, function well and look great! From regular cleanings and exams to advanced restorative treatments, all of your routine dental needs can be met right here. Tooth loss results in the deterioration of tooth-supporting bones. This, in turn, leads to aesthetic and functional problems for your mouth. Implant dentistry keeps the situation from getting worse. Dentists will take small, screw-shaped titanium posts to replace the missing tooth’s root. Unlike other surgical procedures, implant surgery is minor and will only require local anesthesia. After the healing period, dentists will top the implant with custom-made crowns. Implants have a success rate of 95 percent, which is higher than other tooth-replacement solutions. Over the counter teeth whitening systems may seem like convenient options, especially for individuals with busy lifestyles. Bleaching trays, whitening strips, and whitening pens claim immediate results. But are these enough? DIY whitening products work to some extent, but they do not guarantee the same results as professional teeth whitening treatments. Some of these methods could even result in harmful side effects (e.g., teeth sensitivity and damaged gums). Stay on the safe side and opt for professional whitening services, instead. 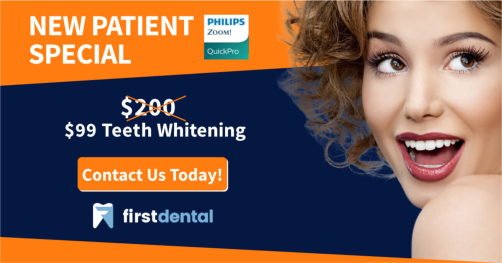 First Dental’s professionally supervised whitening lightens teeth three to eight shades in an hour. Unlike over the counter whitening products, our procedures work faster and are safer for your teeth and gums. Dentists use crowns to cover the entire part of the tooth. These dental caps are used to restore your tooth’s original appearance and function. Our crowns can be made from ceramic, porcelain, or gold. Crowns, however, are not enough to address extreme cases. Advanced gum diseases, severe decay, abscesses, or fractures require bridgework to replace the damaged tooth. Bridgework preserves your natural smile, chewing capability, and facial structure. As its name indicates, tooth bridges “bridge” the gap between your teeth as dentists place crowns on either side of the gaps. We encourage you to contact us via phone or our online form. Please use the contact form above to contact us online. For directions to the office, please click the map below. If you have any questions or comments, please feel free to get in touch.